The PediSpa as seen on TV gently removes calloused and dry skin! 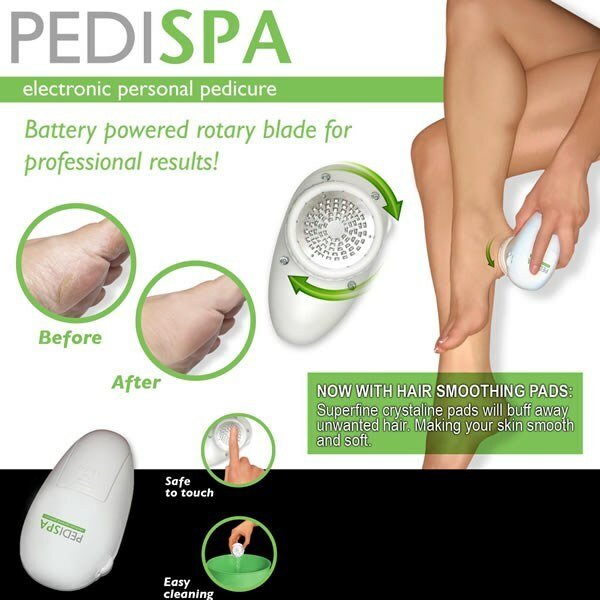 The PediSpa as seen on tv is the Electronic Personal Pedicure! Gently removes calloused and dry skin, leaving your feet feeling baby soft. Pedi Spa gives a professional pedicure with out the mess. Pedi Spa Pedicure removes callused, dry skin, from your toes, heels, sides and balls of your feet. Pedi Spa Pedicure System has a battery powered stainless steel rotary blade that gently and easily removes callused skin from your feet, leaving your feet looking and feeling softer than ever. Pedi Spa Pedicure System can be used safely on toes, heels, sides and balls of the feet.